With Jay-Z headlining Glastonbury, Snoop Dogg at the helm of a high profile insurance ad, Ice-T and LL Cool playing crime fighters in hit TV shows, Pharrell Williams dominating the pop chart and Dr. Dre's headphone company bought for billions by Apple – it is truly impossible to imagine the modern world without the influence of hip-hop culture. However, in the early 70s there was no such thing. Kids in New York had no idea that the scene they were inadvertently creating would go on to become this global phenomenon. As a teenager, Joseph Saddler was one of these pioneers. Growing up listening to and becoming obsessed with his dad’s record collection, his taste buds were fine tuned from the outset. When he witnessed early block parties featuring fellow DJ architects such as Kool Herc, it was only a matter of time before he, as Grandmaster Flash, brought his own ideas and innovations to the table. Or should that be turntable. Inducted into the Rock & Roll Hall Of Fame for numerous accolades: notably the inventor of the DJ mixer crossfader, the backspin theory and perfecting the art of turntablism – Flash’s influence extended to performing DJ sets live with MCs freestyling over the new tracks he created by cutting up breakbeats; essentially the backbone of hip-hop music to this very day. pivotal, social commentary often hailed as the most important hip-hop single of all time, ‘The Message’. This is the full length 12” cut that rightly opens this brand new compilation in Sony Music’s acclaimed ‘Collection’ series. With 650,000+ sales in little over a year, two No.1 albums, one Platinum and two Gold certifications, plus an industry standard Music Week Marketing Award; following UK DJs Trevor Nelson and Pete Tong, the team at Sony Music decided to head to the Bronx and the true origin of the genre in order to create unquestionably the definitive selection of credible hip-hop club anthems. ‘The Grandmaster Flash Collection’, out August 18th 2014, has been a true labour of love and personal journey for Flash. Collating a triple album of the most important tracks from the last 35 years has been no easy task. Including the blockbuster hits and unearthing the rare gems that still light up dance floors, Flash felt like he was handed the keys to King Tut’s tomb (if King Tut was a rapper!) when he was approached. Ensuring the album 100% reflected his tastes; Flash also hit his deep book of contacts in order to personally secure the kind of artist support only he can – meaning exceptionally rare clearances on the album such as Eminem’s classic chart topper ‘Lose Yourself’ (which has never appeared before on a compilation album). In addition, stretching the modern rules of licensing as a result of Flash’s far-reaching heritage in the record industry, Sony Music asked Flash to take to the decks and create one of his monumental DJ mixes (included on all formats – digital and CD). And the result has been nothing short of breathtaking. 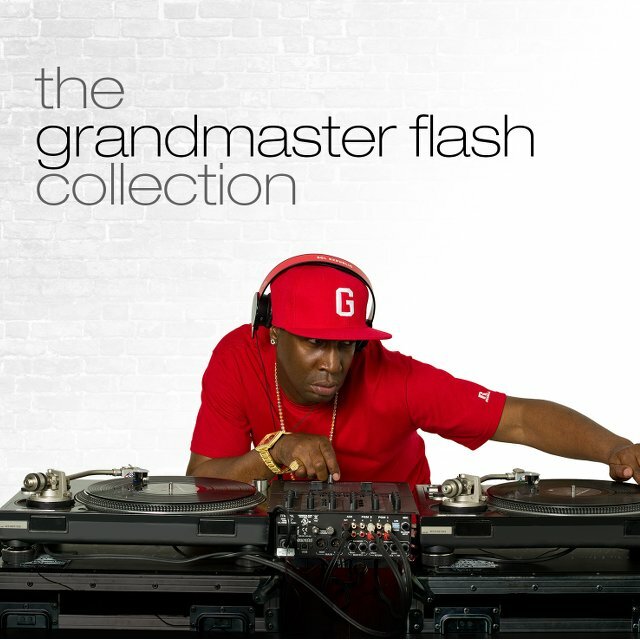 ‘The Grandmaster Flash Collection’ features a plethora of hits that perfectly encapsulate the hip-hop scene; from fellow legends The Sugarhill Gang, Run-DMC, Big Daddy Kane, LL Cool J, Eric B & Rakim, EPMD, Digital Underground, N.W.A. and Afrika Bambaataa; through to golden age 90s stars such as Nas, Gang Starr, Jay-Z, Wu-Tang Clan, Cypress Hill, A Tribe Called Quest, Naughty By Nature and The Notorious B.I.G; alongside modern club bangers from Busta Rhymes feat. Kanye West, OutKast, Redman, Public Enemy, Ludacris, Missy Elliott, DMX, Lupe Fiasco and the aforementioned Eminem. Furthermore, Flash knew it was equally important to also include some timeless underground club joints from his record box – ranging from Nice & Smooth, Mobb Deep and Das EFX, to Lords Of The Underground, Black Sheep, Chubb Rock and Pete Rock & CL Smooth.